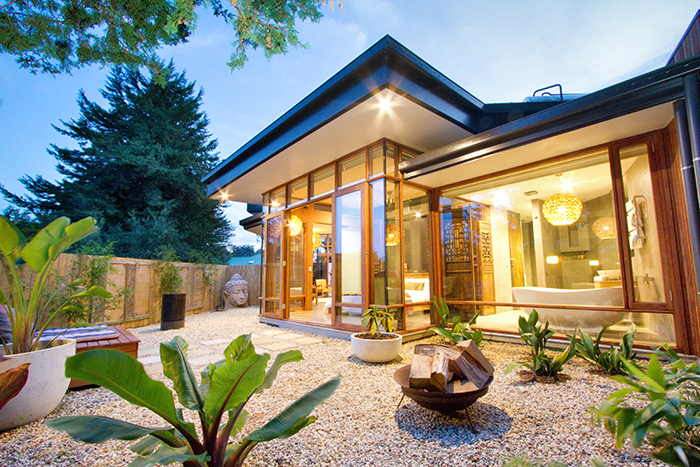 Our award winning accommodation is situated in picturesque Stirling, Adelaide Hills. 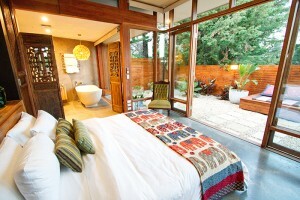 There are 3 villas to choose from offering Bed and Breakfast rates and various gourmet retreat packages. From a one night stay to long term stays, there is an abundance of things to do in the area including some 50 cellar doors in this Adelaide Hills Wine region. Our Villas are the ultimate in luxury B&B accommodation in Stirling and opened in March 2013. The accommodation was soon awarded the prestigous accolade of Hotel of the Week by the Australian Travel and Indulgence and won the SA Architecture Awards 2013. The accommodation and cooking school have twice been featured on SA Life TV and Getaway. Great Chefs, even Tetsuya, have stayed with us. Our accommodation is rated 5 out of 5 by our customers on Trip advisor and Ranks #1 of Speciality lodgings in Stirling. We have been awarded the Hotelscombined Recognistion of Excellence for 2017- scoring 9.9 out of 10 across all hotel review forums. Exclusive yet affordable they are an architectural inspiration of luxury holiday Villas often seen in places such as Bali, Thailand and Japan. Purpose built for wow factor, every Villa offers a spacious 2 roomed 70m2 of indoor living area , a private walled 45m2 outdoor courtyard plus individual gardens in which to explore and relax. Each Villa is individually styled and architecturally designed for seamless indoor and outdoor living. Floor to ceiling glass surrounds each villa allowing views and easy access to the private enclosed courtyards and landscaped gardens. All Villas have the luxury of under floor heating and stunning Jag kitchens and are finished with inspiring designer furnishings. Perfect for long self catering stays, or book for just one night. If you also wish to do a cooking class with us then there are several great value packages available for cook and stay combinations. If staying the weekend why not participate in one of the gourmet tours or engage one of our personal Chefs to cook you a romantic dinner or deliver a private cooking class in your Villa. Which Villa will you Choose? All our villas guarantee to evoke the senses, inspire the creative and deliver a first class award winning bed and breakfast experience. Which one will you choose...? 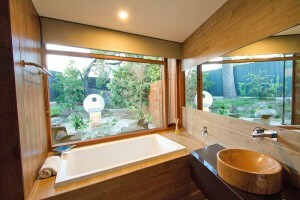 Yoko Villa boasts Japanese Gardens, stunning Shoji screens, Japanese bath and two person luxury shower. 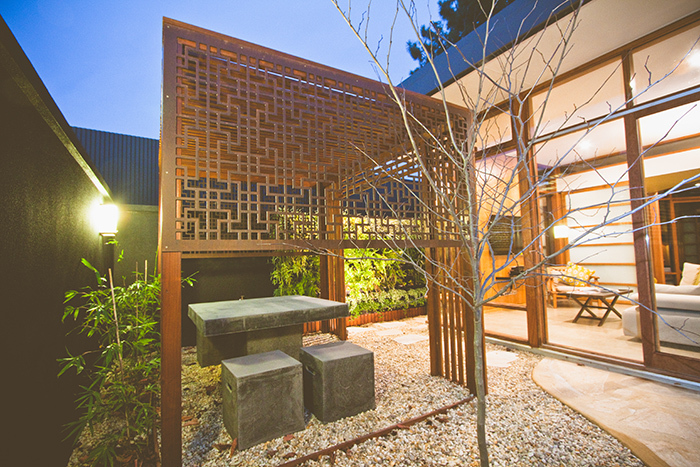 In the courtyard, experience the impact of a vertical living garden wall while you recline and relax under the shade of the Japanese Tea house or enjoy the view from your bedroom of the Japanese Maple and towering Maritime Pine. Indoors you will be treated to modern Japanese styling with low slung sofas, designer hanging lamps, natural wood and stone finishes and a striking top of the range Jag Kitchen. 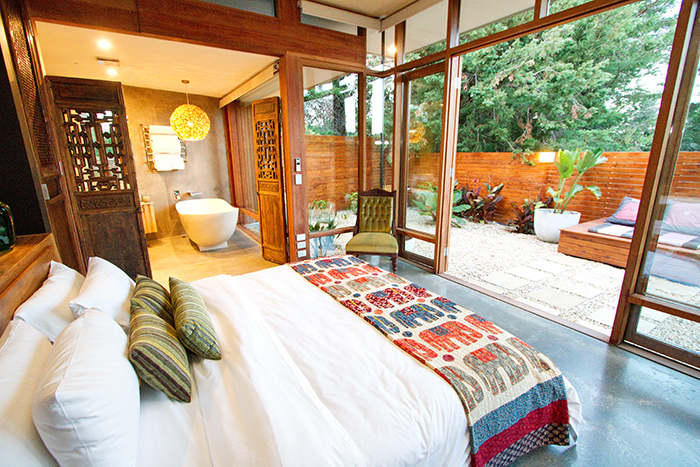 The Japanese bedroom boasts a king sized bed, shoji screen doors and floor to ceiling glass. French doors open out from the bedroom into the private gardens and remote control block out blinds cocoon you at the flick of a switch. In the bathroom imagine reclining in a deep Japanese bath tub looking out at the garden views or if you prefer, have fun and enjoy the dual overhead rain shower with someone you love. Like all our Villas, the Japanese Villa has its own sunny north facing private walled courtyard with outdoor relaxed seating and fire pit. 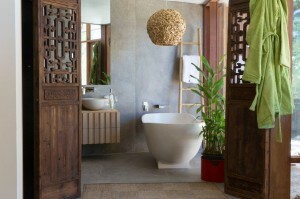 If Balinese is more your thing then the Bali Villa will more than impress with it's feature stone bath with fountain wall spout, giant timber day bed, outdoor decks, Buddha water feature and ambient lit Bali Hut. Indoors your senses will be awakened by the warm reds and golds of Bali décor, the feel of natural wood and the warmth of the designer lighting. 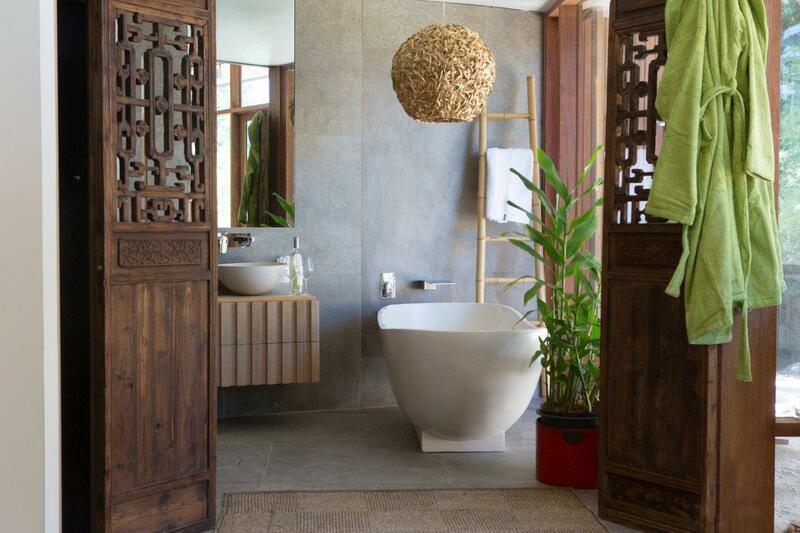 Our Bali Villa bathroom has the feel of natural stone with the luxury of under floor heating, Balinese stone bath and overhead rain shower. Step out through the bedroom's french doors to your own private rear deck or slide open the 3m floor to ceiling glass doors to your private walled sunny courtyard complete with Bali hut and fire pit. Like all our Villas ,the Bali Villa has a top of the range Jag kitchen and remote control block out blinds in the bedroom. The Manager's suite has Zen like decadence and the romance of moody decor, a stand alone bath in an open plan bedroom and an indoor shower under the branches of ancient pine trees. Used by our prestigious interstate and international guest chefs the managers suite has its own north facing sunny courtyard housing a top of the range BBQ and its Jag kitchen with 3.5m island bench is the biggest kitchen of them all. In the bedroom, flowing sheer curtains create intimacy and romance is suggested by the stand alone bath with its dimmable over head pendant lighting. A separate ensuite bathroom uses large format Italian tiles to accentuate the floor to ceiling window shower area which is tucked under the shade of the mature pine trees. 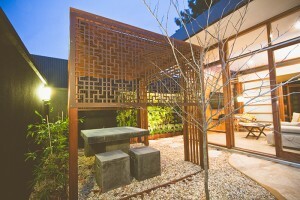 Like all our Villas, the Zen Villa has outdoor relaxed seating , underfloor heating and remote control block out blinds. We thought we would share the reviews and testimonials from recent customers who have stayed at our luxury Bed and Breakfast accommodation. All customers to date have rated us 5 ticks on Trip advisor. Truly spectacular design and the promise of wine in the huge bathtub lured us into a state of ‘love at first sight’, and then after we sat down with the 3D glasses to watch a film after our phenomenal cooking class, we wanted to marry the place! Cheese and wine in the fridge, plus breakfast supplies, a fluffy white kingsize bed, underfloor heating – all the good parts about hiding away in winter – we were in HEAVEN. Be warned Sticky Rice – if I can’t get in contact with that architect – I am moving in here! Light filled,private,quality mini house perfect escape from Adelaide when you don’t have the time to travel. As soon as I walked in the door of Yoko I felt calm and in the mood for bubbles! There is something magical for me about a beautifully executed building that makes you feel like you have a different life! After the degustation meal at nearby Maximillions we were ready to enjoy this fabulous accommodation -we lit the outdoor fire, hopped in the very deep bath to watch the flames, cracked the bubbles and the rest is history! We had such a restful time that we slept in too late and couldn’t cook up the lovely breakfast that was left for us as we had a babysitter waiting. Highly recommend you enjoy this, stop looking at your belle & vogue mags and go live for a night or more in the pages!! The villa was certainly everything we wanted. Was beautifully appointed and had everything we needed. The walk through when we checked in made it easier to know how to work everything. The cooking school was fun, Yuki was energetic, fun and friendly. The food was beautiful. Overall a great experience. We stayed in the Bali Villa and joined in one of the many cooking courses available, both experiences were fabulous! The course was great fun and the Villa beautifully appointed.Every need was met, and our expectations exceeded. Everyone associated with the Sticky Rice Cooking School and Villas showed an unusual desire to genuinely exceed the expectations of their guests. Claire was welcoming and cared that she shared in my surprise weekend for my wife’s birthday celebration, which included the surprise arrival of our children and their partners who stayed overnight in the Yoko and Bali Villas. One of the staff even made an emergency dash to the local wine store late on Friday evening to satisfy my daughter’s need for Baileys! The accommodation was excellent and spotlessly clean. My wife loved the Zen Villa, which is decadent and brooding but I was more impressed with the openness and the thoroughly modern Japanese styling of the Yoko Villa. 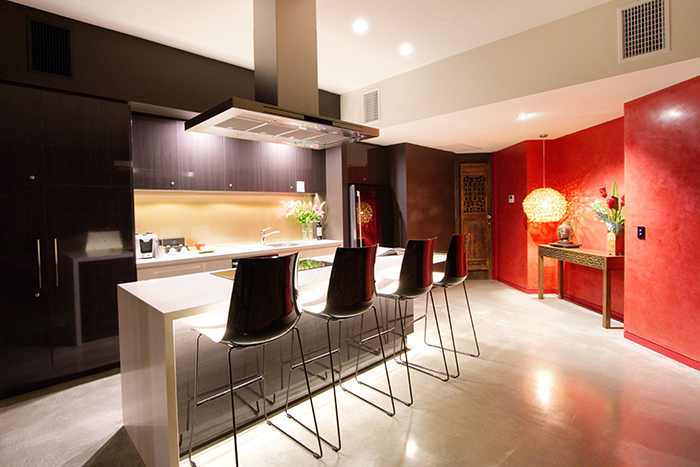 The Zen Villa was great for entertaining our children and their partners with its impressive chefs kitchen and well-appointed communal lounge space.The local sourced breakfast provisions were generous, probably overly so, and the complimentary wine excellent. We all loved the cooking school experience, which was warm and inviting and sitting down at long trestle tables to share food, wine and stories with other aspiring cooks made it a truly memorable birthday celebration. We loved this experience. We stayed here for our tenth anniversary last month. We were in the Yoko villa which is spacious and stylish. The bathroom is just gorgeous and the whole place is framed by timber and glass so you feel like you are sitting in the garden. Every detail has been thought of and Claire has dreamt up a wonderful hideaway. We didn’t leave our villa from check in to check out. We took food to cook together for dinner and enjoyed the fabulous new kitchen. We will definitely return to such a high quality villa not far from the city. We stayed at the Sticky Rice Villas in the Bali Villa so we could also enjoy our cooking class experience (without having to drive back to Adelaide) which is held on the same property. Both the villa and the cooking class were fantastic and definitely worth the 30 minute trip from Adelaide to Stirling. 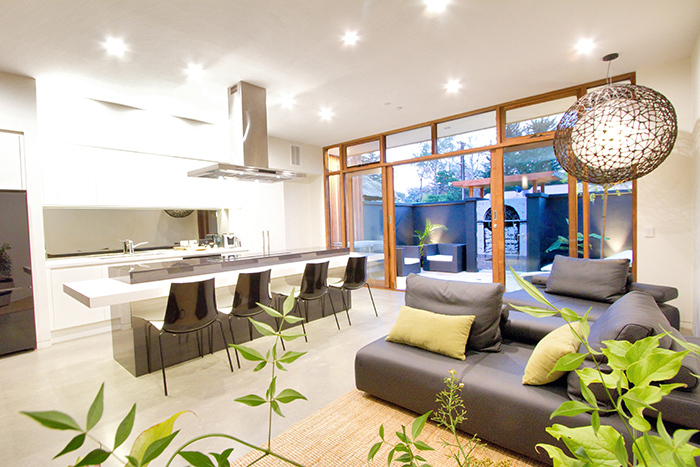 The Bali Villa is very spacious, has a warm feeling due probably to the north westerly facing full length windows which draws the Bali garden and sun into all the rooms. The gardens are very private and secure and it has an outside Balinese lounge to relax in. 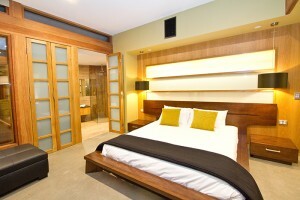 The room has all the modern facilities that work with the theme of the villa. Claire took time out to show us around the rest of the villas and any of these would definitely be worth the stay. The cooking class was a great way to learn some new skills while enjoying a wine and meeting people with similar interests .Great weekend away. From culinary celebration to sumptuous surroundings, the sticky rice villas and cooking school soothes the soul and satisfying the appetite. 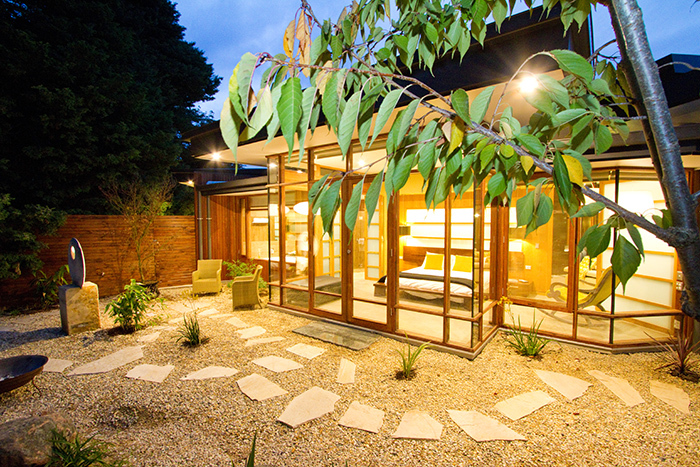 Nestled amidst the sprawling Adelaide hills it is surrounded by wineries and endless adventures. From the moment we arrived we were made to feel welcome by the owners infectious personality. 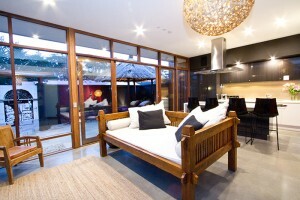 We had booked in for two relaxing nights in the Bali villa in conjunction with an Asian cooking class. On entering the villas courtyard we are transported 2335 miles to a stunning recreation of a Balinese paradise. The authentic thatched hut is but one of many traditional Balinese pieces making this villa a visual banquet. The blend of the traditional and the modern works in perfect harmony catering for all. With an emphasis on privacy and luxury this villa rates amongst the finest. We were the first visitors to stay in the Bali “hut”. It was architecturally designed and beautifully decorated. It felt like we were on holidays in Bali! It was warm, light, modern, very comfortable & luxurious. The space connects beautifully with the outside & the kitchen is definitely set up for foodies. We were so grateful for Claire’s hospitality & attention to detail. Would thoroughly recommend a cooking class while you are there.